“Normal triglyceride levels and coronary artery disease events: the Baltimore Coronary Observational Long-Term Study” Journal of the American College of Cardiology (1998): Miller, M., Seidler, A., Moalemi, A., Pearson, T.A. Dr. Moalemi was born in Tehran and left Tehran at the age of 12. She lived in 3 South American countries before coming to the United States and hence is fluent in Spanish. She is a busy mother of three children, one in college and two still at home. Her main hobby is reading. She is an ardent reader of American history, biographies, scientific breakthroughs and social psychology. 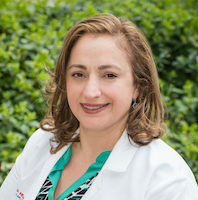 Dr. Moalemi went to medical school at the University of Maryland School of Medicine and completed her first two years of internal medicine residency at George Washington University Hospital. She completed her senior year at the Mount Sinai University of New York. Dr. Moalemi’s fellowship training in cardiology was completed at George Washington University Hospital. 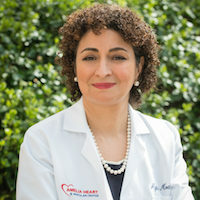 She served as Senior Cardiology Research Fellow at the National Institutes of Health where she obtained additional training and certification in the field of nuclear cardiology and cardiac MRI. Dr. Moalemi is board certified in Cardiology and Nuclear Cardiology and is a registered vascular interpreter. She is a Fellow of the American College of Cardiology and a speaker in the field of heart disease. She lived in South America and completed her primary and middle school education in South America and hence is fluent in Spanish. Dr. Moalemi serves as a Clinical Assistant Professor of Medicine at George Washington School of Medicine and was named a Washingtonian Magazine 2016 Top Doctor. Dr. Moalemi is highly regarded by her peers and her patients. You can read her reviews at Vitals.com, Ratemds.com, and Healthgrades.com.